Tutorial: [AVATAR] Become a real Na'Vi using GIMP! Many of you surely know the new film (by James Cameron) which already became the most successful film of all time: AVATAR! I'm a fan of the movie and so finally i had time to write a tutorial on how to make yourself into a real NA'Vi ;) Enjoy! Open up any portrait photo. If you want to use my template please download the image /w the woman above! Now duplicate the background layer and work on the copy from now on. First step is to do some face “correctures” – we’ll need bigger eyes and of course a deformed nose thats more connected with the eyes themselves (these are the typical characteristics of that blue race which is named Na’Vi). Use the IWARP-filter (Filter / Distort / IWarp). Select “Move” and change the values to 30 (Radius) and a strength of 0.3. These values are used for an image that is 1000×1000px big. If you have a bigger picture increase the radius. Now start at the top of the nose in the middle: drag the parts of the top nose a little to the left. Work from top to bottom of the nose. Do the same for the right part and be aware not to move to much of the nose into the eyes. By now the eyes should be looking normal again, we’re now going to make them a bit bigger, Select “Grow” and a radius of 70. Then move the mouse into the center of the pupilles (left and right eye) and click 3 to 4 times, each time the eye should become a little bigger. Now click OK! If your new nose is not looking fine repeat the steps 2-4. In the middle of the nose the skin is now looking much too deformed and does not look natural. Use the Clone tool, set the opacity to 50% in the tool adjustments, which will bring you more smoothness. Hold CTRL and set a cloning point at the bottom of the nose (the brighter skin there). From there we’re going to clone: now click the skin above to replace the unnatural looking skin. Now choose a starting point to clone inside the forehead and rebalance the skin tone to become a real smooth transition between nose and forehead. Now we’re getting the cool blue skin in ;) Finding the right blue tone is a pain because the blue skin in the movie is allways a little different because of the different lights. Of course the whole picture now is colorized. But we’re working on a copy, so thats good, because we can now use a layer mask to bring the original hair color and else back in. As a preparation for the layer mask we’re goint to use the Quick Mask, where you can paint on a temporary layer using black and white to get a really detailed and nice selection. Click the “QuickMask”-Button in the bottom left part of the image window. A red overlay is now shown. You can now paint “Black” and “White” and of source with gray tones on this layer. Black color (this is the red overlay in the beginning) represents full transparency in the selection and white represents fully selected parts after finishing the QuickMask. Now choose the paint tool and use a big smooth brush that has a radius of more or less of the size of her arm or hand. Using white color, paint all the skin pretty fast – you dont need to be too careful here. Next choose a smaller brush and carefully paint the eyes with black to make it transparent after we finish the masking. Tip: Use the X key on your keyboard to swiftly switch between the selected foreground and background color. Now paint more carefully along the skin (inside the skin use white, outside black) to refine the selection. - Finally take care of the part with the blurred hair on her left shoulder. Therefore set the opacity of the paint tool to app. 30% and paint over the skin that is covered with hair. This will give you a semi-transparency. Do this for the hair on the head too where the skin is shown. Take a lot time on this step to create a very nice selection – it is important to get a authentic feeling. Now it’s going to be interesting ;) Click the QuickMask-button again – you’ll get a nice selection of it. Right click the layer in the layers dialogue and choose “Add Layer Mask”. Choose “Selection” in the popup dialogue and click OK. Now the below layer should shine through and only the skin will be blue. Looks pretty good so far, but the blue skin does not perfectly fit yet. You can refine this now by clicking on the mask beside the layer in the layers dialogue and there use the paint tool again to paint with white (will be shown) or black (will be transparent). We’re getting to the eyes now. The race on Pandora (the planet where the Na’Vi live) have big yellow/orange eyes. Choose the Elliptical-Selection tool and drag a selection around the iris. click Edit / Copy visible and Edit / Insert as new layer. Move the part around the eye again. The iris should be on a seperate layer now. Use the Transform-tool now and scale the iris to 125%. Use the Eraser tool to cut overlapping parts of the iris so that it fits inside the eye. Now do the same for the right eye. If you’re very exact you can remove the yellowish tone of the little white glare inside the eye by making a selection around it and use Colors / Desaturate. Next we need some cool tattoos. They allways have zig-zag-like paintings on their whole body. Create a new layer and use the free select tool now to make that kind of painting. Hold SHIFT to add more selections at once. After you made the selection fill it with Black: Select Black as new Foreground-Color – then do Edit / Fill with Foreground color. Make the same for the arms. Activate the lock-transparency button above the opacity ruler in the layers dialogue. That brings some irregularity into the tattoos. Decativate the lock-transparency. The paintings are a bit too hard on the edges if you look close to it. - Filter / Blur / Gaussian Blur: 10px. - Colors / Curves: Move the curves together as shown below. Take the eraser-tool and delete overlapping paintings. Now add a layer mask, activate it by clicking it and use Filter / Render / Plastic Soise again (values below). then set the layers mode to overlay. You can experiment with other layer modes that darken the image if you want so. Now duplicate the layer with the tattoos / paintings again to make the effect a bit stronger if you want (this is optional). Finally we need some sparkle in her face. - create a new layer: then take the Brush tool again and use the “Sparks”-brush, use a small brush scale (0.2 or so). Click often to paint single many dots under her eye, on her nose and on the forehead. If you dont like some of the sparkle you can remove it using the eraser tool. Set the layers mode to “Dodge”. Duplicate the sparke layer and do a Filter / Blur / Gaussian:8px. Here is my first version – i na’vi’ized Paris Hilton – hahaha – looks imo a bit too plastic tho. 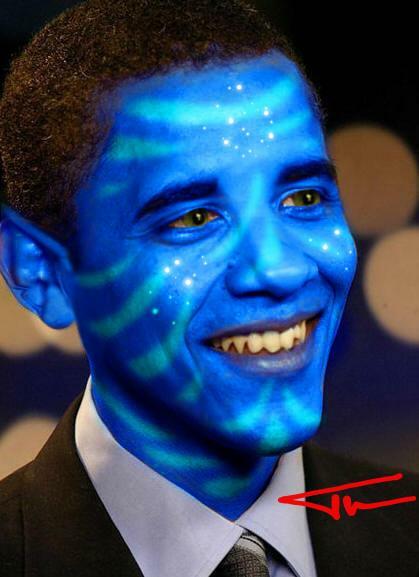 This topic ([AVATAR] Become a real Na'Vi using GIMP!) has been rated 4.7/5.0. Great tutorial, I am very impress. I am facing a short problem in step no 20 I can't remove overlapping paintings. but the result is not bad. can you help me about it ? I am waiting for your help. I like this tutorial very much. Hey there, thanks for the tutorial. I got only one thing and that is the step 7. When i use - import your color balance the pic is different. I dont know how to have an "avatar" color. This would help me a lot. Thanks in advance. Cheers. Excellent - I will try this :) thank you. it just don't clear what you did with the lips. But I just have 1 more prob (bear with me) I am really having trouble with the tatoos... See for yourself! Thank you! You really helped! The tutorial went great for me! Hi! I admire yor work gretly but I am stuck on colour balance. When I tried using the examples on intro... But I can't use decimals on colour balance, so what do I do? Can you please reply to me and tell me the colour selctions etc? Hi, Thanx for a wonder full Job. Since I am newb with Gimp, i'd like some more detailed steps. These can help us "new born" Navis to learn faster. Gimp is a wonderfull tool and I love it. Please help me and others to be GOOD. Thanks to every one who has contributed with great tutorials. I have tried many and it's fun to be able to create some thing and learn at the same time. A spesial Thanx to the DEV's of this wonderfull tool! Great tutorial, I managed to do it too thanks to you! You missed the spot under the right armpit, it is not blue. Great tutorial, I'll bookmark it and try it out this weekend. I hadn't heard of the IWarp plugin before, but it looks promising. If your final product of the Paris Hilton looks plastic, maybe it's because she looked plastic to begin with? -->Try to max zoom in on the nose so your movements can be more accurate. -->Try to decrease the amount the effect does and maybe even the radius. -->Just start at the top of the nose(bone) in middle and drag carefully left, back to middle drag carefully right. Do this all the way down, but it takes time. And since there isn't a ctrl+Z while applying the effect, do small steps apply, and apply again. Im stuck on the iwarp part. The eyes keep getting dragged down with the nose and the middle part of the nose is not as flat. This tutorial looks really awesome, however I couldn't get past the blue skin because for some reason, my color balance won't let me do decimals? Does anyone know how to fix this? I've tried many ways, but it just won't let me get between 0 and -1. :/ Help please. Hey Devvv Have you added the ears yet? I think that with this tutorial we have the better result in the network! Can anyone record a video of it, please? Devv I added your pic to my deviantart gallery here's a link: http://guitarguy3.deviantart.com/art/Avatar-Gimp-Tutorial-165194180 drop all comments there and I'll even drop some questions on the tutorial there. WTF??? Why does it keep adding spaces to the comments? Devv I added your pic to my deviantart gallery here's a link:http://guitarguy3.deviantart.com/art/Avatar-Gimp-Tutorial-165194180 drop all comments there and I'll even drop some questions on the tutorial there. Devv why didn't you include the ears in the tutorial? I know your picture has hair covering the ears but you could've at least added the info on how to do the ears. Then why didn't you include the ears in the tutorial devv? I know your picture has hair covering the ears but you could've at least added the info on how to do the ears. you need to deform the ears in the same way as the nose using the IWarp filter! Here's mine... hope you like it. Open to suggestions and improvements. I love the tutorial, and the end result looks very nice, but I don't know what you mean by the "Sparks" brush. Is it something I need to download, or am I just being clueless? try 15 for the move-option, should work fine! "Use the IWARP-filter (Filter / Distort / IWarp). Select "Move" and change the values to 30 (Radius) and a strength of 0.3. These values are used for an image that is 1000x1000px big. If you have a bigger picture increase the radius." what about the radius for a 640x480px picture? after you click the quickmask-icon (bottom left of the image window) again the quickMask sould turn into a selection. this selection should then be used when adding the layer mask. does this help? Stuck at step 11, "Add Layer Mask"
Thanks, devvv. Apparently I was making it much harder than it needed to be! I'll have to give this another try real soon. One thing I have done following a video tutorial, with very similar steps. nhoriginal: you only need to save the file - the extension is not important, use .txt i.e. I'm running into trouble with the first part of the tutorial - the part about importing the palette. I've discovered that I need to create a file with a .gpl extension in order to import it into the palette. And I've been able to import another palette I found on the web, so the import part isn't a problem. But what do I do with the text that appears for the navi_blau link? I've tried copying and pasting it into a new ASCII file as is, and saving it with a .gpl extension. I also tried removing the top and bottom commented sections, but no matter what I do GIMP tells me it's not a valid palette file. Can someone help a clueless user? Thanks. And I'm using GIMP 2.6.8.